For many years we have been accustomed to the supercar and superyacht. We have the luxury brands of supercars such as McLaren, Ferrari, Lamborghini, Bugatti, Jaguar, Porsche and Mercedes. In the superyacht world we had names such as Feadship, Lürssen, Heesen, Perini Navi, Oceanco, Blohm & Voss, Sunseeker, Princess and Arcadia. This to name but some of the companies out there, setting the standards for the super luxury market. Yet we did not have the superhome. No one had defined a superhome. We of course had castles, mansions estates and large houses, but the term superhome was not clearly defined or used. This was until one international designer burst onto the scene with his highly original concepts and superhome designs; dedicating his time to establish the concept of the superhome and pioneer a new lifestyle not conceived in this way before. Pioneering British born designer, Chris Clayton set out to introduce a new market, a new type of home and to create a new concept of luxury lifestyle; to take architecture to uncharted levels and bring about a new potential to have a superhome, to match the superyacht. It all started with one burst of imagination, when he created the first superhome. It was called Utopia and soon became fondly known as The James Bond House. The reference to James bond was the designer’s childhood dreams of the amazing villain’s homes in the Bond movies and his dream of creating homes equally as incredible. Over many years and numerous spectacular designs, Chris and his international design brand, ‘Asetti’, are now synonymous with the term ‘superhome’. They developed a new type of luxury home for the discerning client looking for something special, something unique and wanting the best of the best; clients who had achieved great success in their given fields through hard work, imagination and great skill; who would understand equally high levels of quality, luxury and design perfection. It was Asetti’s goal to develop unique ideas, transform a home into a work of art and leave a lasting legacy of human achievement. This also includes their constant desire to lessen the impact on the environment and introduce as much energy saving technology into each superhome, where possible. In addition, within the client’s requirements, Asetti always try to blend each home into its natural setting. Asetti continue to live by their motto, ‘architecture is art’ and produce some of the world’s most spectacular superhome concepts; to take home design to the very highest levels of creative imagination and quality. Currently Asetti are the only architectural studio devoting their design skills, purely to superhome design. What is a superhome ? 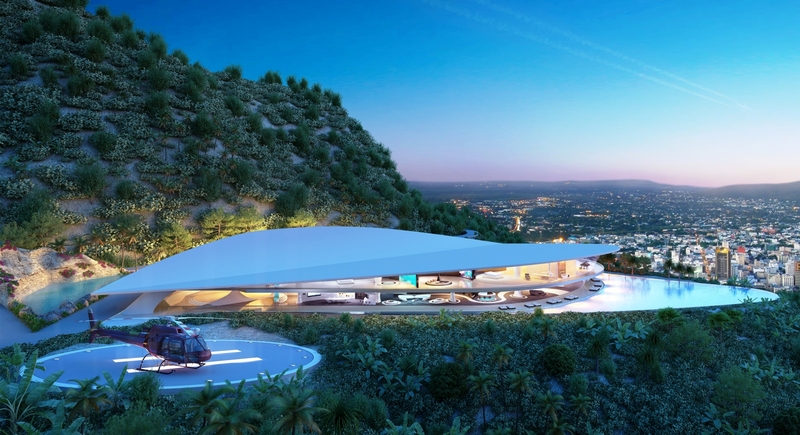 A superhome is a new luxury home created and developed to the highest level of design capabilities, be of a unique style, a size of more than 3,000 sqm (32,000 sq.ft) and have a certain number of permanent staff. Originally in Asetti’s words, they use the term to describe a home they design of more than 5,000 sqm (53,000 sq.ft). Yet as certain land plots could only facilitate a home of 3,000 sqm, if it was still created with the highest possible levels of design purpose, be of a unique conception, then the term was used to refer to 3,000 sqm or above. This resonates with superyachts where originally parameters meant it had to be a commercially operated luxury yacht (motor or sail powered), professionally crewed and had a load line length of 24 metres and above. However, over the last 20 years the numbers of large yachts increased so more recently this tended to be increased to 65 metres (213ft). Even new terms such as megayacht and gigayacht were introduced to define the elite (longer then 100m) among luxury yachts. So as with superyachts, a superhome has no specific clear definition, other than what Asetti created during their pioneering days and continue to do. Asetti are, as described by their reputation… The Kings of The Superhome.